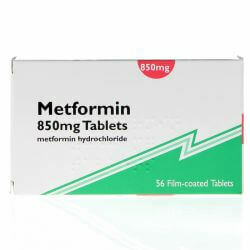 Metformin 850mg 56 Tablets belongs to a group of medicines called hypoglycaemics. 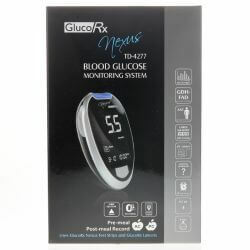 It is used to treat those with Type 2 Diabetes, that diet and exercise alone have not been able to control the blood sugar levels. It works by lowering the amount of sugar in the blood. Please take this medication exactly as prescribed by your doctor. Usual dose is 850mg twice a day, the doctor may slowly increase the dose depending on your response to treatment. Your dose may use a combination of 850mg tablets and 500mg tablets. Take Metformin 850mg 56 Tablets with or after a meal, to avoid having side effects affecting your digestion. These tablets are to be swallowed whole with a glass of water. 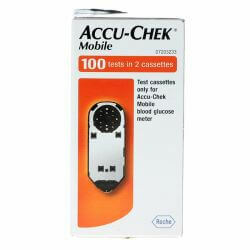 If you take more then you are prescribed contact a doctor or your nearest hospital straight away. If you forget to a dose, DO NOT take a double dose to make up for a forgotten dose. Take your next dose at the usual time. The active substance in Metformin 850mg 56 Tablets is 850mg of metformin hydrochloride. The other ingredients may differ depending on manufacturer. Please read the patient information leaflet before taking. As with all medicines, Metformin 850mg 56 Tablets can cause side effects although not everyone will experience them. If you experience any of the side effects listed in the leaflet or not listed please consult your Pharmacist or GP. Please inform your GP if you are pregnant or planning on becoming pregnant as your treatment will need to be changed. This medicine should not be taken if your are breastfeeding. Metformin may cause a very rare, but serious complication called lactic acidosis, particularly if your kidneys are not working properly. Symptoms of lactic acidosis are vomiting, bellyache with muscle cramps. a general feeling of not being well with severe tirednees & difficulty breathing. If this happens to you stop taking the metformin immediately & contact your doctor or nearest hospital staright away.